Secondary supply laws were introduced into the Western Australia (WA) Parliament last week. This is an important win for parents who want to protect their children from alcohol and for the broader community who want to keep young people safe and healthy. It will become illegal to supply alcohol to a young person under 18 on a private premise without the permission of their parent or guardian. I think this is a wonderful step, not least because I’ve been campaigning for these laws for more than three years. The journey to this point has been intensely exhausting, challenging, and ultimately rewarding. When I began I thought it was just me who felt frustrated and perplexed by the fact people could legally supply alcohol to other people’s kids. If I did not want my child served alcohol, then in my mind no adult has the right to do so. But the law in WA didn’t back me up. I soon learnt this issue was just as important to many others as it was to me. In March 2013 I launched the “Introduce Secondary Supply Laws Petition” on Change.org – by June that year over 6,000 people had signed it. Many people approached me in public or via phone, email or social media to say they shared my concerns and to join in calling for secondary supply laws. They too were puzzled and concerned that their child could be supplied alcohol without their permission – whether champagne at a pre-ball party, drinks at a sporting celebration or weekend house party, or for school leavers events. The stories people shared with me spurred me on. It became so much a part of my life I am sure at times my family wondered what was going on with me. The more I learnt, the more reasons I found to be concerned. In addition to the physical and emotional harms, researchers were discovering more about the longer term effects of alcohol on young people, including its impact on the developing brain. I have seen reports about early onset alcohol-related dementia, impacts on decision-making skills and the problems that affect not only drinkers, but also those around them. Secondary supply laws are more than just another piece of legislation. They empower parents and other adults to stand firm in their decision not to provide alcohol to minors. They directly support the message that for under 18s, no alcohol is the safest choice (a practice recommended by the NHMRC). They set an important community standard consistent with that message and they provide real consequences for those who supply alcohol inappropriately. The petition was tabled in the WA Parliament while WA’s liquor laws were being reviewed. In January last year, the Liquor Control Act Independent Review Committee recommended secondary supply laws be introduced. To my relief, the Government listened to the overwhelming community support and agreed to the recommendation. It has been a privilege to help give a voice to the concerns in the community about alcohol and our young people, and to talk to the many people in WA, and elsewhere, who want to see the changes to the role alcohol plays in our lives. Some reports have shown indications of encouraging trends in alcohol use by teenagers – though a recent article in the Medical Journal of Australia suggests that the evidence does not support this conclusion. Crucially, the harms from alcohol continue. As The West Australian reported recently, alcohol ambulance call-outs here are increasing – including more than one a day for a child so drunk that they need urgent medical attention. Far too many children and young people are obtaining alcohol underage and consuming it at hazardous levels. We owe it to them to act. Secondary supply laws are now in place in most Australian jurisdictions. The impact of these laws, particularly through educating the community about what is and is not appropriate, should not be underestimated. I expect public discussion about both the laws and the risks associated with young people’s drinking to contribute to the changes we need in our teenage drinking culture. It is my hope now that the WA Government will build on this momentum and act on the community’s broader concerns about underage access to alcohol. I hope we will also see action on some other recommendations of the Review Committee, including controlled purchase operations to reduce alcohol sales to minors. The end of my campaign for secondary supply laws in WA is now in sight. I look forward to the next steps. 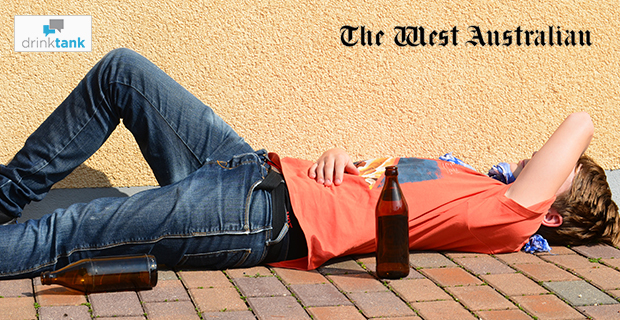 This post first appeared in The West Australian on 25 August as ‘New laws a big step in underage-drink battle’. Great example of effective public health advocacy. Sam you made this happen! Many people have been involved in campaigning for secondary supply laws around the country…but in WA, Sam Menezes has pulled all of the support together into a focused campaign, she’s stuck with it, welcomed the interest of media, put the effort in throughout the process to update supporters and maintain the issue on the agenda of MPs…and now we’re seeing the results. What a great example of what passionate community members can achieve! Important to note that the Laws have only been introduced to Parliament and are not currently Law in Wetsern Australia. Only once the Bill has passed Parliament can the law be enforced.